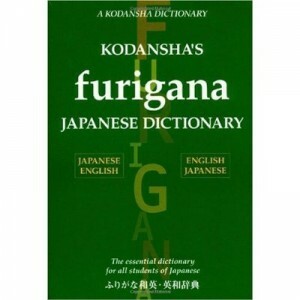 Kodansha’s Furigana Japanese Dictionary is a beginner’s dictionary in which words are given in kana, and English. The kanji (Chinese characters) are included in each definition, with the furigana. What is furigana? It’s the small text written below a kanji that explains how to pronounce the kanji. For beginners, the best thing about the Furigana Japanese Dictionary is that its entries contain so many examples and phrases. This makes it easy to not only understand the meaning of a word but to also be able to use it. One feature I particularly like is the detailed levels of usage: Colloquial, Crude, Formal, Honorific, Humble, and Semi-Formal. This is very important in Japan as levels of formality in Japanese are so different. At 717 pages you obviously won’t be slipping Kodansha’s Furigana Japanese Dictionary into your pocket but it is a excellent desk reference and would be valuable to any beginner or intermediate-level student of Japanese. The dictionary is 60 dollars but you can get it from Amazon for just $31.49 saving you $28.51!